Ok so before you shout “COLES, you molls!” we’ve actually branched out further than our local supermarket monopoly and hit up a lot of small Melbourne bakeries because it’s important to support local business, you dirty chain-supporting rats. As a result, we’ve tasted some of the best Hot Cross Buns in all the land, and some of their distant cousins i.e. Hot Cross Donuts (waaaaaaat). So after some very rigorous tasting sessions, note taking and fisticuffs well-spirited debate, we’re excited to announce this year’s Hot Cross Bun champions for 2017. All hail Rustica Sourdough, the 2017 Hot Cross Bun overlord of Melbourne. These bad boys were hands down the tastiest traditional buns we [blindly] tested, and it also helped that their chocolate variety was packed with WEDGES of chocolate, so when you popped them in the toastie machine, the choc oooozed everywhere (including on your laptop, but by-gawd it was worth it). Aussie Farmers’ Direct are the OG bun bakers, having taken out the gong in the 2016 awards. Unfortunately, they fell just short this year, and by fell short we mean they absolutely killed it, Rustica Sourdough are freaks. Our Aussie Farmers’ Direct delivery arrived one cool Autumn morning, and all 24 were cleanup by midday, which is one hundy puh-cent testament to the absolute deliciousness of these buns. Not only were the tradish buns light, fluffy and heart-stoppingly good, but their chocolate buns took at least five years off our lives (no regrets). Let’s stray from the basics and head straight into luxe-land. 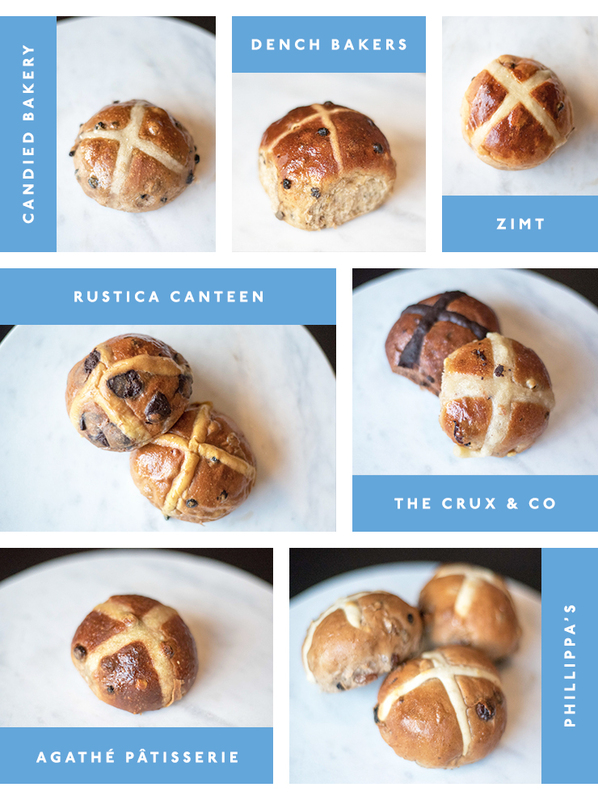 A big shoutout to The Crux & Co for destroying all bun aesthetic expectations with their traditional and choc buns (a special mention to them for their CHIC packaging as well). Similarly, Gontran Cherrier and Agathe’s buns were glazed to perfection and very generous in size. A special shoutout to Candied Bakery for their Hot Cross Donuts (YAS KWEEEN). Think hot jam donuts but with dried fruit and Easter spices, and then think dangerous calories, and then think f*ck it, what a time to be alive. Another special mention goes to Oasis Bakery for their Nutella chocolate buns—you certainly know how to treat a girl (and make rich, moist chocolatey hot crossie buns). A final shoutout to Baker D. Chirico and Pidapipo who partnered up this easter to bring us GELATO BUNS. They’re like ice cream sandwiches except the biscuits are CHOCOLATE HOT CROSS BUNS. We’re still recovering from the emotional and physical toll these desserts had on our bodies. Of course we have to shine a light on the by-the-book traditionalists among the Melbourne Easter food scene. Phillippa’s buns have always been consistently good and 2017 has was no different. Their buns were beautifully symmetrical, deliciously glazed and perfectly dense. Chez Dre, another top-shelf Melbourne bakery, delivered the (literal) goods with their fruity buns (I’m so sorry, I don’t mean to pack this article with innuendo, but I’m also not repeating ‘hot cross buns’ 37 times). Other masters of the traditional fruity bun are Dench Bakers and Yardmill who reminded us that you don’t need 100g of choc chips and a custard filling to have a good time (though we don’t discourage it). A big hats off to Proof Is In The Pudding who nailed the choccie variety with their traditional style bun and choc chip additions and then BONUS homemade, 8-hour chocolate fudge spread (because butter is so 153AD). After many tastings, we’ve concluded that the trick to a god (nay, GREAT) choccie hot X bun is retaining the traditional style bun and packing it with choc chips, that way it’s not too rich and you can eat more than three with feeling sick (winner!). And lastly, some bloody special mentions to Oakridge Wines for their perfectly dense traditional buns, Zimt for their equally scrumptious traditional buns (and adorable gingerbread Easter treat inclusions), bonus points for their immaculate presentation (nestled in fake straw—#bless), and lastly, Tivoli Road, for their deliciously orange-y buns. Want to make your own Hot Cross Buns? We've put together this pretty great recipe.